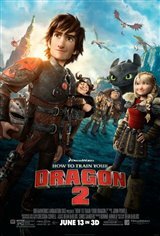 Five years after Hiccup (Jay Baruchel) and Toothless successfully united dragons and vikings on the island of Berk, Astrid (America Ferrera), Snotlout (Jonah Hill) and the rest of the gang have fun with a new contact sport in which they race dragons, grab sheep and dump them into a net. Meanwhile, Hiccup and Toothless enjoy adventures of their own as Hiccup adjusts to having only one leg and enjoys his new flying apparatus. While riding their dragons, Hiccup and Astrid discover a dragon trapper named Eret (Kit Harrington) who captures Astrid's dragon, Stormfly, in a net. Eret was hired by Drago Bludvist to catch dragons for his dragon army. Hiccup wants to find Drago to let him know that dragons are kind and that there's no need to capture them or to form an army, but his father, Stoick the Vast (Gerard Butler), barely escaped being burned alive the last time he encountered Drago and forbids Hiccup to approach him. Headstrong Hiccup doesn't listen and sets out at once with Toothless to find Drago. Although he finds a long-lost family member along the way and a beautiful haven where dragons live in peace, he also puts his friends and family in danger in his quest to change Drago's mind.